Phillips Grocery is located in Holly Springs, Mississippi (there’s another location in Oxford too). It’s located right near train tracks that were involved in the Van Dorn Raid of the American Civil War. 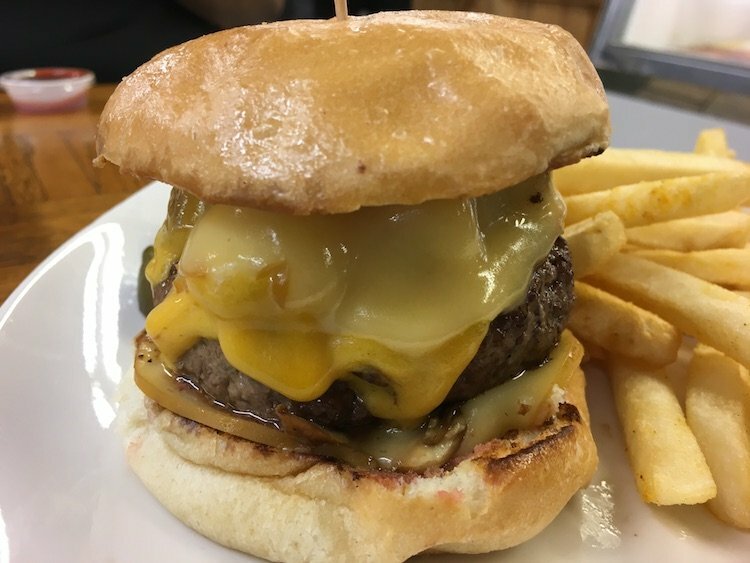 The two-story house was built as a Saloon in 1892 by a former Confederate soldier, became a Grocery Store in 1919 and then started serving Burgers in 1948 under the new ownership of Mr. and Mrs. W.L. Phillips. Stepping through the doors of Phillips Grocery is like going back in time 60 years. Inside it’s filled with all types of old soda signage & memorabilia along with a wide of array of seating options including old school desks. The menu is on a blackboard that’s right above the expediting window and behind the order “counter”. I’m mentally set to have the 1/3 Burger w/Cheese, Mustard, Onion & Pickles and make a quick last-minute addition of the Patty Melt. Crinkle Cut Fries and Fried Peach Pie round out the lunch equation. What’s interesting about the Patty Melt is that does not only go the bi-cheese route but it comes with the standard grilled Onions and Peppers, yes Peppers. Both Burgers have a nice little meat crust on them, it is not burned as some folks seem to think. They also come wrapped in wax paper with the Patty Melt already halved, not my preference or suggestion. They use fresh never frozen beef here. Which one was better? I’d have to tip my hat to the Patty Melt on this one. The Fries were crinkle cut and fried just right (not oily) but I’d suggest skipping them and trying out the two Burgers instead. The Peach Pie was Fried and good but I’m thinking I might have been off buying one of the Moon Pies they had for sale on the table at the counter. George Motz turned me onto Phillips Grocery, and as a fan of R.L. Burnside, I knew of Holly Springs so I’m glad I got to check out this part of the United States and experience some Burger History. But it was average at best. You shouldn’t have added Lettuce & Tomato.